Now that we finally got a pizza stone-something we’ve wanted for a while- we obviously had to make pizza on it, and so we did it as soon as possible. We were really, really happy with our first homemade pizza attempt involving a pizza stone! We’ve made homemade pizzas before but (with the exception of the Grandma Pizza featured on this blog) they have never been very good. The bottom crust has been soggy, the sauce too pureed and paste-like, and just lacking in flavor and never as good as a pizza restaurant pizza. However, this crust was really wonderful, full of flavor and just the right texture. The sauce, too, was great. We ended up altering the sauce recipe a bit as we went along to get it to our liking, but at the end we got it just right, to the perfect texture and flavor for our pizza (although we are probably going to try a couple other sauce recipes, particularly the one from Cook’s Illustrated, to see if we like any of them better. Still, this one was delicious.). We baked our pizza at 500 degrees. The last pizza had a better crust than the first, because the oven got hotter as we went along. We recommend heating the oven for at least a half an hour or so before putting in the pizza, and possibly upping the oven temperature to 525 or 550 degrees if your oven allows it. This is the first pizza we’ve tried, but certainly not the last, so you can look forward to many more pizzas to come, possibly with a more creative spin on them! Measure the warm water into a 2-cup liquid measuring cup. Sprinkle the yeast over it. In the bowl of a stand mixer fitted with the paddle attachment, combine the bread flour and salt. Mix briefly to blend. Add the room temperature water into the measuring cup with the yeast-water mixture. With the mixer on low speed, pour the yeast-water mixture into the flour mixture and add the olive oil. Mix until a cohesive dough is formed. Switch to the dough hook. Knead on low speed until smooth and elastic, about 5 minutes (add more flour if needed to achieve this consistency). Transfer to a lightly oiled bowl and turn to coat. Cover with plastic wrap and let rise until doubled in size, 1½-2 hours. Combine all ingredients in a saucepan over medium-high heat. Bring to a boil, then reduce the heat to a simmer. Let cook for at least 15 minutes until slightly thickened. Remove from the heat. If desired, use an immersion blender to break up some of the larger tomato chunks. Refrigerate until assembling the pizza. Deflate the dough by pressing down on it. Transfer the dough to a lightly floured work surface. Divide the dough into two equal pieces. Form each piece of dough into a smooth, round ball. Cover with a damp cloth. Let the dough relax for at least 10 minutes but no longer than 30 minutes (after 30 minutes, it will start to rise again. If this happens, deflate the dough and let it relax again for a shorter period of time, then use it). 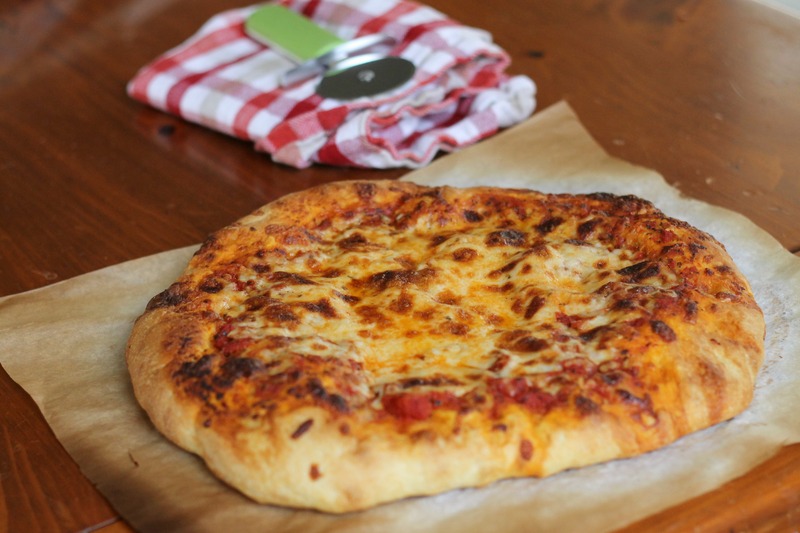 To bake, preheat the oven and pizza stone to 500˚ F+ for at least 30 minutes. Transfer the dough to a square of parchment paper on top of a cutting board, lightly sprinkled with cornmeal. Shape the dough with lightly floured hands, making a rim for the crust. Brush the rim of the dough with olive oil. Top with a layer of the sauce, and then with the cheese. Transfer the pizza-topped parchment to the hot pizza stone, using the cutting board for support and easy transfer. Bake until the crust is golden brown, and cheese is bubbling and melted, 8-12 minutes. Let cool a minute or two, then slice. Enjoy! Side Note: You’ll likely have extra sauce. Freeze it, or store in the fridge if you plan to use it within a week or so. We don’t recommend using this sauce for pasta, but it would be good with breadsticks or in a stromboli. Also, if you’re serving more than 6 or 7 people, make 1 1/2 batches of dough (3 pizzas) or 2 batches (4 pizzas). You can do this one batch at a time in your stand mixer, or just briefly mix the ingredients all at once in the stand mixer and finish kneading by hand. If doubling the dough, don’t double the sauce- you’ll have a lot extra. 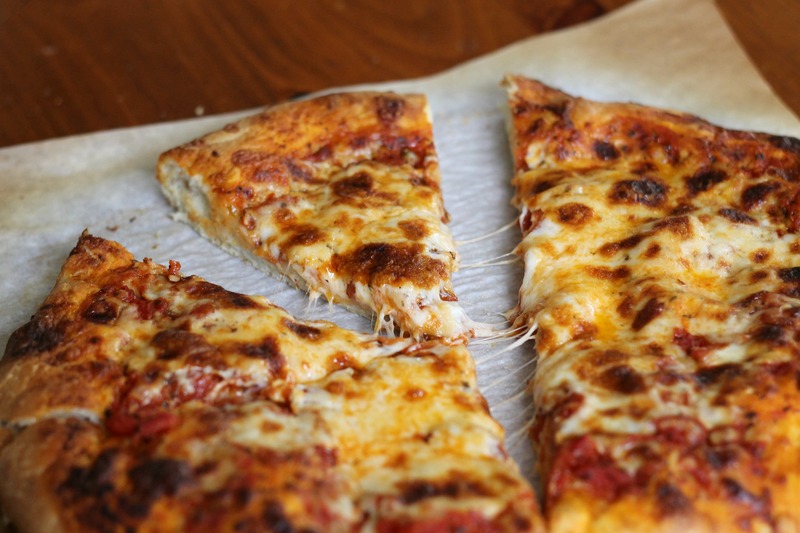 It depends on how much you use on your pizza, but 1 batch or 1 1/2 batches of sauce should be plenty to cover 4 pizzas. If you’re making 3 pizzas, do a single batch of sauce. Annie’s Eats goes into detail about freezing the crust in her post about crust, which is linked above, if you’re interested. We hope this is helpful to anyone planning to serve a crowd or make a large quantity ahead for quick weeknight meals!